Discussion in 'Marvel Costumes and Props' started by OmanTortuga, Oct 20, 2011. Well seeing how this years NY ComicCon is now in the books, it is time for me to start looking to another costume for next year! I am thinking that I will be dressing up for both Saturday and Sunday next year. Sunday being Ultimate Captain America again and Saturday I am gonna be one of my other favorite characters, Hawkeye ! I am thinking of doing the Dark Reign version cause I like the look of the costume and it has long sleeves to cover the tattoos on my arms. I have some ideas of what I am gonna do with the costume. A rubber mask similar to what I have for Ultimate Captain America... But for Dark Reign the artists switch between a black and purple and a navy blue and purple costume. Not sure which I want to do yet, but I am leaning towards the darker themed black and purple. Any advice and opinions will be very much appreciated! That would be pretty awesome. 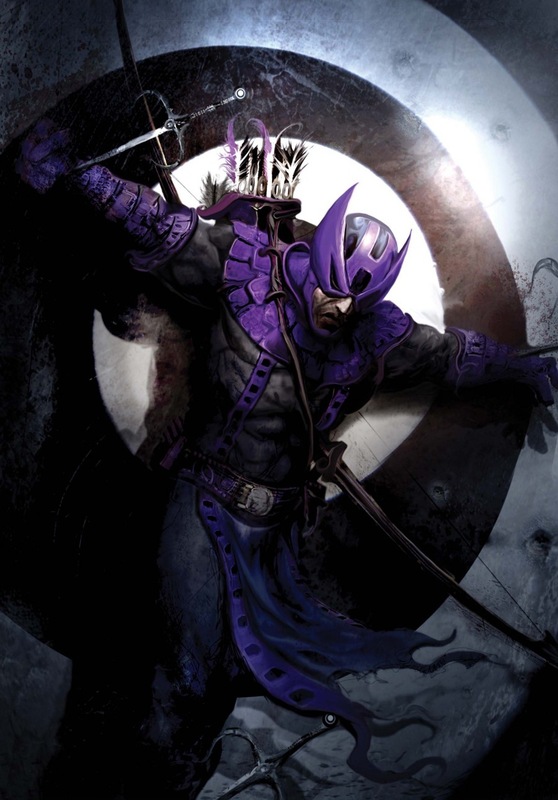 I know Bullseye's Hawkeye costume isn't that much more different than Clint's but I just prefer that look more overall.